Question: Is it possible to eat healthy at a BBQ? What are the best choices? Answer: Of course it is! In this guide you’ll find that healthy eating at a BBQ is easier than you think. With summer comes beautiful sunshine and outdoor activities, including parties and get togethers that revolve around food. While I’m not advocating you skip out, there are a few things you can do to create a healthy balanced plate and still enjoy the company of family and friends. As we know, eating at a party is about more than just the food. It is also a social and cultural experience. And we should savor that, with health in mind. 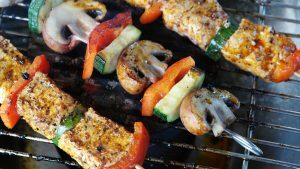 Here are a few tips to help you make healthy eating possible at your next BBQ. 1. Be Mindful of Portions. Don’t worry, I’m not asking you to break out your measuring cups and spoons. Instead, use the MyPlate concept. Make half of your plate fruits and vegetables, with the other half split into grains and protein. Include dairy in your meal by having a slice of cheese on a burger or making a potato salad using plain yogurt instead of mayo. Using skewers of meat and veggies is also a great way to build in portion control. Not to mention, you can personalize it with the things you like best! 2. Bring a dish of your own. To be certain there is at least one nutritious dish, ask your host if you can contribute by bringing something. The good thing about a BBQ is that guests are often asked to contribute. Make a healthy vegetable side dish, bring some lean protein or veggies to throw on the grill, or even make a fresh fruit salad. 3. Pick your protein wisely. Stick to lean protein if possible, like chicken breast or low-fat turkey burgers. If you want beef or pork, pick a burger over a hot dog and add a ton of healthy toppings (lettuce, tomato, onion) to make it more filling. Another option if it’s available and you don’t mind it, is a meatless burger. They’ve come along way in taste and are typically lower in saturated fat and calories while being full of protein and fiber. 4. Be sensible with sides. Choose mostly nutritious options, including corn on the cob, grilled vegetables, and baked beans. If you really want a tasting of the heavier sides, serve yourself 1/2 cup or less and savor every bite! This includes things like pasta or potato salad, macaroni and cheese, corn casserole, and coleslaw. 5. Don’t forget the condiments. Don’t undo all of the great choices you’ve made this far by covering your foods in condiments! Use these sparingly. Low calorie options include mustard and relish, but keep in mind these are quite high in sodium. Condiments to really watch portions on include ketchup, BBQ sauce, mayonnaise, and salad dressings. Serving size for these options are about the size of the tip of your thumb. Now you’ve got a simple guide to get you on your way to healthy eating at your next BBQ. And don’t forget, it’s not just a meal, it’s a get together. If you focus more on the time you’re spending with friends or family, you’re more likely to have a great time no matter what you eat! ← What is The Best Time to Exercise? Jamila [“Jay-mih-luh”] Lepore is the Nutrition & Health Extension Agent for Hillsborough County. 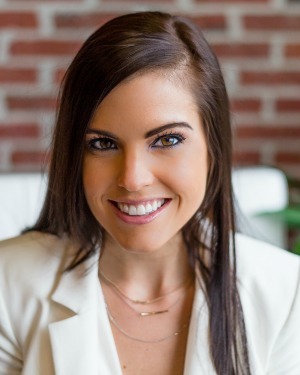 She is a Registered Dietitian Nutritionist (RDN) with a Masters in Food Science ACE certified personal trainer.